I read the announcement a few days ago over on Cartoon Brew but having bought the DVD back in 2008, it doesn’t matter that much to me. 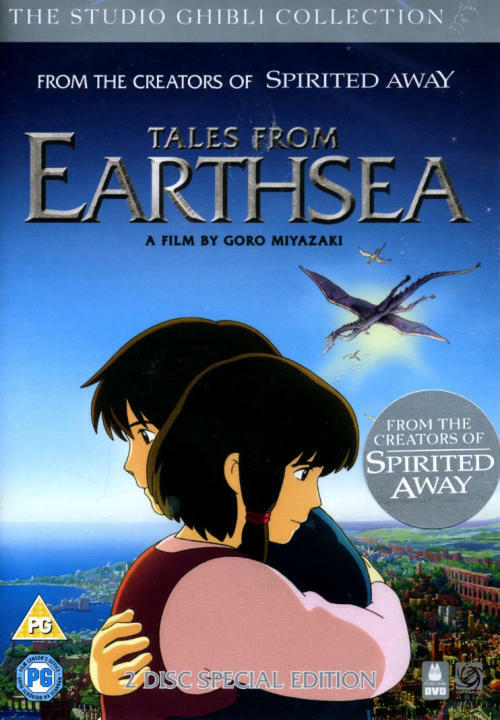 Having said that, I’d thought I’d post my thoughts on a movie that while from the venerable Studio Ghibli, is not by it’s most famous director but rather his son, Goro. The movie is based on the series of books by Ursula K. LeGuin but differs substantially from the original material. The protagonist is Arren, a young lad who has run away from home after murdering his father, who just happens to be the king. He meets a wizard by the name of Sparrowhawk who saves him from a pack of wolves. Arren follows Sparrowhawk into a bustling city, where he rescues a young girl named Tehru from a bunch of tough guys rounding up people and forcing them into slavery. The story takes an interesting turn with the entrance of Lord Cob, an apparently powerful wizard who is in search of the source of eternal life. Strange things begin to happen to Arren and eventually, it is up to Sparrowhawk to help rescue him, along with Tehru. The film is vastly different from those we have come to know and love from Hayao. The plot is more complex and at times bizarre. There are many subplots presented that the viewer must contemplate while watching the film. Not that any of this detracts from it, not in the least. If anything it rewards the viewer in a different way than Hayao’s works. The plot does tend to wander though, and I suspect that about 15 minutes could have easily been removed from the film in numerous places to stop it feeling as long as it does. The characters are not as easy to sympathize with as you would expect, Arren is, after all, a murderer. He is somewhat flat, as are the rest of the cast, but that is a minor quibble. The voice-acting talents of Timothy Dalton and Willem DaFoe (in a very quirky role, even for him) help make up the difference. The animation is superb, with detailed backgrounds, dramatic cities and foreboding castles. The character design is recognizably Ghibli but perhaps on a slightly more muted level. The use of digital enhancements does not hinder the enjoyment of the film. Is it a film worth seeing? Well, that really does depend. If you go into this film expecting a carbon copy of Hayao you will be bitterly disappointed. It is not near the same. Instead, embrace it as the different movie that it is. If you can get past the hurdles of a twisty plot and pedestrian pacing, you will be rewarded by a surprising ending. Personally, it took me two viewings before I could say I enjoyed it.